I cannot start virtual machine after upgrading my Mac to OS X Mavericks. I get either a "Virtualization support is disabled" or "Unable to load the Parallels Driver" error message. The virtual machine performance may be degraded because the hardware virtualization support is disabled on the host computer. Parallels Desktop for Mac kernel extensions are not loaded on OS X Mavericks. 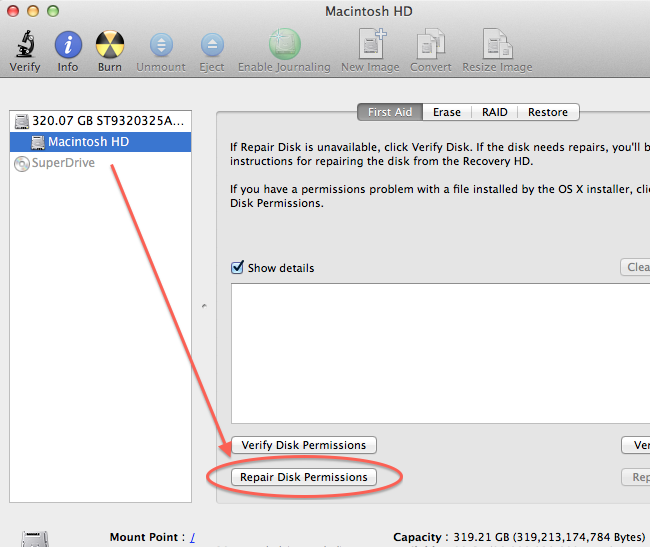 Click on your Mac Hard Drive and then click on Repair Disk Permissions. Wait until the operation is done. Note: After you reinstall Parallels Desktop, you will have to reboot your Mac to install it properly. For information on how to install OS X 10.9 Mavericks (release) in a virtual machine in Parallels Desktop 9, please see KB 118806. For information on how to install OS X 10.9 Mavericks Developer Preview in a virtual machine please see KB 116282.